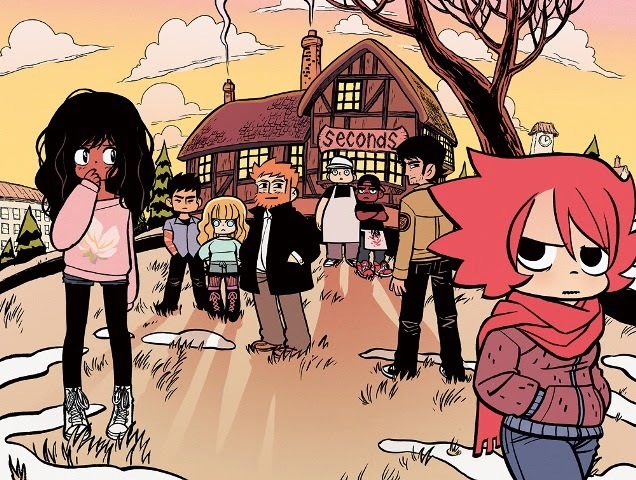 One of my favourite comics of the last decade was Scott Pilgrim by Canadian cartoonist Bryan Lee O’Malley. It became its own little phenomenon and everything built to an exciting final volume followed, just a couple weeks later, by the release of the film adaptation by fan favourite director, Edgar Wright. It’s a modern comic book success story and ever since the release of Scott Pilgrim’s Finest Hour, that I and many other fans of O’Malley have been eagerly anticipating the release of his next comic. It’s finally here and Seconds doesn’t disappoint. My initial reaction to Seconds is that it feels hefty at over three hundred pages. I had no idea how long the book was going to be because I haven’t really read much of anything about the comic. I knew O’Malley was working on something new and that was enough for me. My second reaction is just how familiar his art style is. It’s simpler than what his art developed into during the Scott Pilgrim volumes. Because of that the manga influence in the character is as strong as ever before. The characters look like chibbi manga characters with large heads, big eyes and expressive faces. There is another vein of influence that is new to works by O’Malley and that’s European comics. Specifically more modern series, not Franco-Belgian adventure comedies like Astérix et Obélix. The influence of European comics can mostly be seen in scenes that take place outdoors. Those panels focus on scenery and architecture and it add quite a bit to the overall feeling and tone of the comic. Both influences fit well with the story and despite the cartoonish art style, O’Malley is able to tell a well-crafted story with meaningful themes. The story is a made up of layers of more serious fantastic realism and light-hearted rumour. What made Scott Pilgrim so good for me is that it captured a specific energy and time during a young adult’s life. It’s was also a very good representation of a specific generation during the first decade of the 21st Century. Seconds does something similar by crafting a story around a different part of an adult’s life, the late twenty (and early thirties). Katie is almost 30. She is a chef working at Seconds, a restaurant she opened with the help of friends and business partners over four years ago. Since Seconds opened she’s been saving up her money to open her own restaurant in which she’ll be an equal partner of the business. She’s been working hard and waiting for a long time. She’s getting impatient and her life takes several turns for the better (but also for the worse) when a house spirit appears in her dreams and she finds a magic mushroom. What follows is a story about making choices, fixing mistakes, the rewards of hard work and the shortcomings of taking the easy way out. The comic is about making friends, growing up and learning to be responsible for your actions. There is a Groundhog Day like morality component to the story that combines well with the lighter themes and the humour of the comic. There are a lot of little things I really like in this comic. The way Katie and the Narrator interact is used very well. She can hear the Narrator and she sometimes replies to it, most often when the Narrator is informing the reader of how she feels. Her reply is often to deny what the Narrator is saying and most times it’s pretty funny. I quite like that O’Malley steals a joke form the movie adaptation of Scott Pilgrim and he apologizes for it by writing “Sorry!” in pale yellow letting outside of the panel borders. There is also a nice cameo of Scott and Ramona dining at Seconds. I’m already mentioned that there is a comforting simplicity to the art but that’s not to say there isn’t any detail. Keep your eyes peeled and you’ll find some nice embellishment in the background and added definition to some characters physique and their actions. I also like having a comic by O’Malley that is in colour. I’m never read any of the coloured volumes of Scott Pilgrim and though I would love to own them, I can’t convince myself to buy a comic I already own. This is the first work of his that I read in colour and it was pretty enjoyable. The colours are simple, as it should be in order not to clash with the simple (but effective) cartooning. Unfortunately, I don’t have much more to say about the colouring. It supports the art and the storytelling without getting in the way and that’s already better than a lot of comics colouring. The underlying message of Seconds is a more serious but equally life affirming than the rest of O’Malley’s body of work. 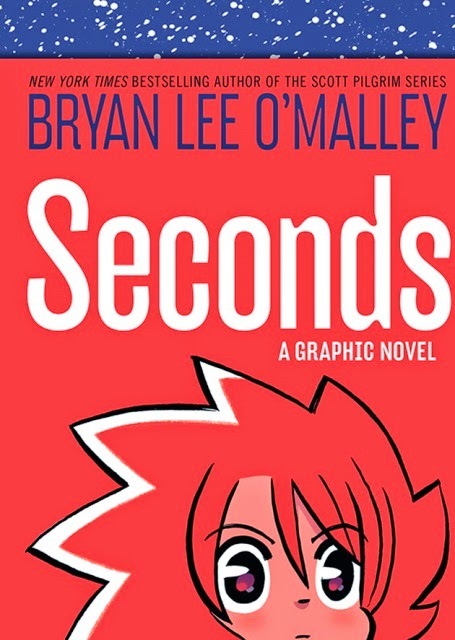 The winning combination of a story about continuing to grow up, even once you’ve reached adulthood, mixed up with plenty of humour and magical realism, Seconds is another example of O’Malley’s successful storytelling formula. It’s not a ground breaking comic but I dare you to find a comic that is as fun to read and will make you think about some of the deeper meanings of life. I love Seconds because the themes connect with me on a personal level. I’m not unique in that regard. O’Malley’s ability to connect with his audience on a personal level, with the style and content of the humour and with the story and its themes, is one of his greatest strengths as a comic’s creator. There’s no news on what his next project will be, but I’m already looking forward to the next chance I can read a comic by O’Malley.